The city of Trujillo is considered the secret cultural capital of Peru and is part of the second largest metropolitan area in the country. "It is known as the city of everlasting spring because of its sunny and pleasant weather year-round," says Wikipedia. Architect Elmer Gutierrez knows the city very well, because it is his home. He also knows that outdoor thermal comfort and quality could be improved: The annual solar radiation, at 2000 kWh/m2, is twice that of a typical German city and can lead to humans overheating in the absence of shade. There is only 2.1 m² of green space per capita, about a quarter of what the WHO recommends for cities. Another concern of Elmer's is the growing pains that young trees face; many do not survive into maturity due to the harsh urban environment. 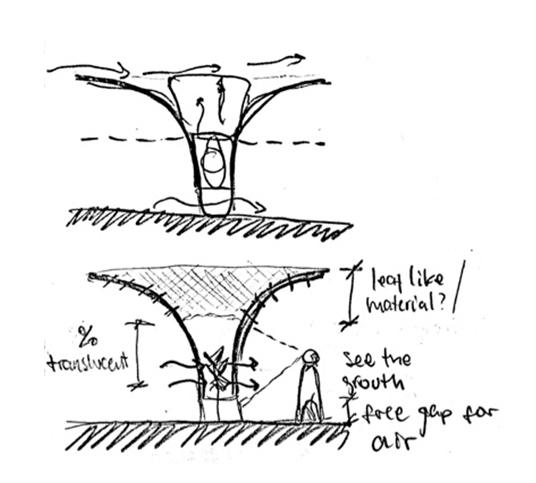 To solve these three issues, Elmer dreamed up a product that would provide shade for the people, protection for the maturing trees and, in the long run, better urban spaces for all.